This workout features drills that will help develop your forwards. Diagram A. Player does traditional Mikan drill but the coach contests every shot. 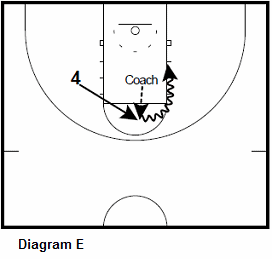 This forces player to hold off coach and finish at the basket. Set goal of amount of makes under certain amount of time. Diagram B. Player rotates around the basket shooting jump-shots 3 feet away. Coach has 2 balls to speed up amount of shots taken. When the player is rotating to left he/she uses the left hand to shoot and vice versa going right. Goal is to make certain under time or consecutive amount of makes. 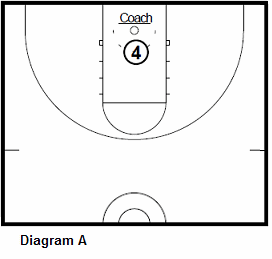 Diagram C. Player alternates between elbow and short corner shooting catch and shoot jump-shots. Diagram D. If player misses at any time they must sprint and touch the opposite sideline. They then continue the drill on that side of the court. Set a goal for makes and/or put the player under time. 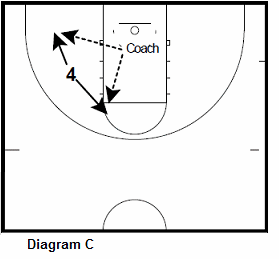 Diagram E. O4 flashes to nail while Coach tosses out ball. Player squares up to basket and attacks with multiple moves. Coach can also add different finishing moves on the attack. 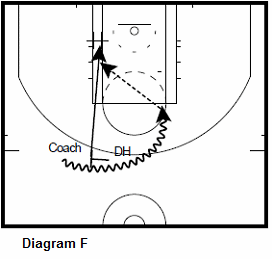 Diagram F. Forward sets pick and roll and dives. Forward then pins the chair (#) and gets fed for a post move. 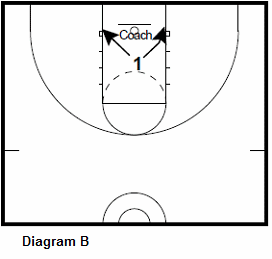 Drill: Run the pick and roll into a dive and pin on the chair. Receive the post feed for a score. 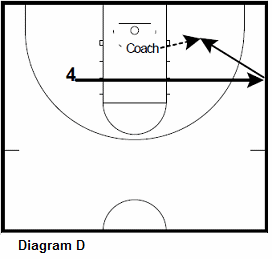 Make 20 on each side of the rim. 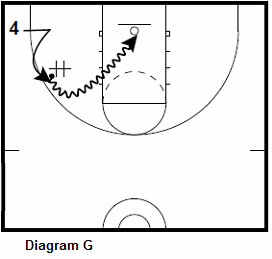 Diagram G. Player cuts towards the baseline and sprints to the chair. Player takes the ball off the chair and attacks. 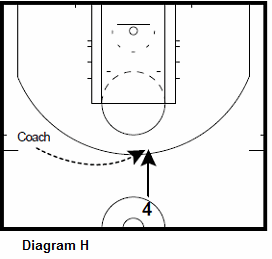 Diagram H. Player starts at half court and sprints to the 3-point line and catches the pass for different attacks out of the trailer position.